Roads are places where the past is viewed in the rear vision mirror and the future viewed through the windscreen. But what is that future? And how far can we see into it? 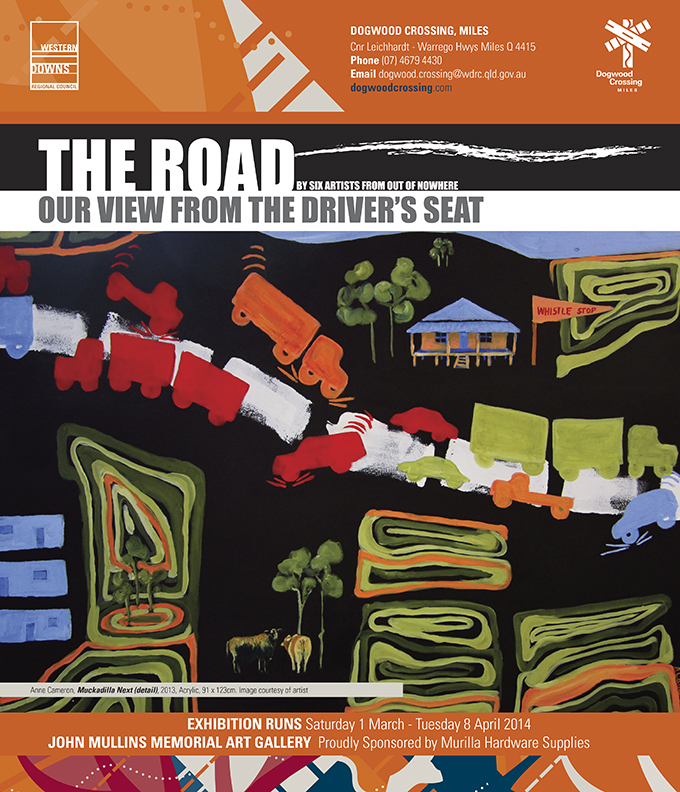 An exhibition at the Dogwood Crossing Gallery presents a view from ‘the driver’s seat’ of the Warrego Highway in southern Queensland and it seems like a pretty hopeless place looking either from the windscreen or the rear-view mirror for that matter. 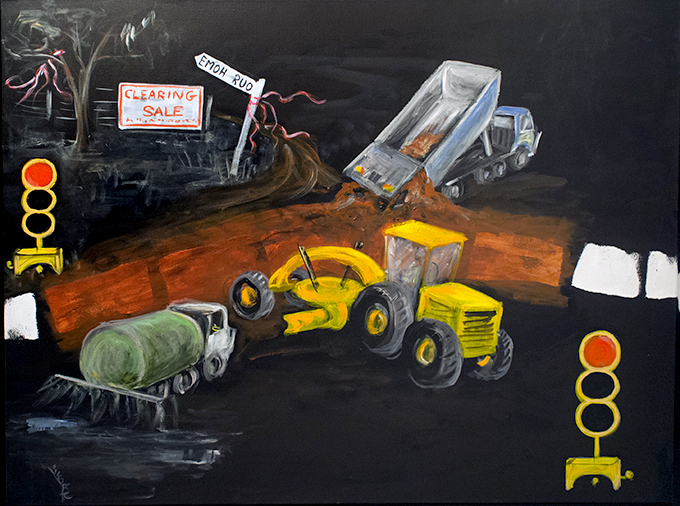 Created by the activist art group 6 Artists From out of Nowhere the place specific artwork snakes and curves its way along the gallery wall with sections of the painting that vary much like the way road surfaces change from shire to shire or road contractor to road contractor. For readers who are not conversant with the nature of Queensland roads: the Warrego Highway passes through the Darling Downs, was once an artery of transportation between the city and the country. Now it has become a congested, clogged and rubbish-strewn vein due to the expansion of the Surat Basin’s extractive mining projects. Everyday masses of material, pipes, personnel and machines use this highway. Massive flooding that occurred over recent years and the abuse of heavy transport has meant many sections of the road are under constant start-stop traffic controls systems while being patched, repaired and upgraded. The 6 Artists from out of Nowhere are country people connected to the land. Their lives and livelihoods are being challenged, by the demands of mining to access and transform land use and also transform the once familiar and reliable road systems. The artists are not happy with this situation. They state: ‘the highway has become so busy and so dangerous that we felt compelled to comment in paint.’ The exhibition is simultaneously a report and a shout for an improvement to the circumstances of those who no other option than to use this thoroughfare. 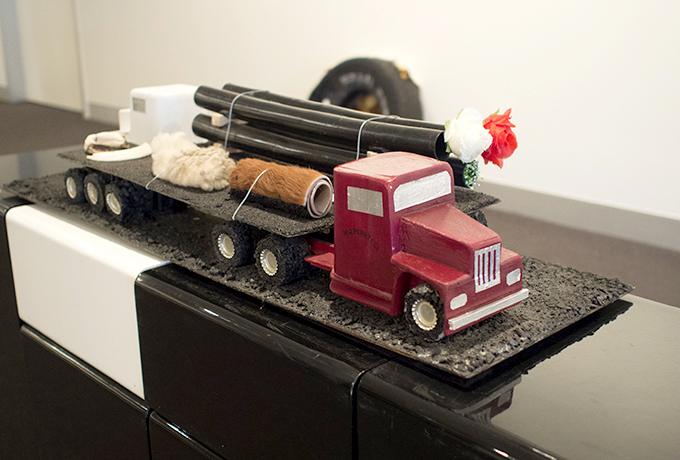 On a plinth in the middle of the gallery floor the sculptural forms of two trucks by Wally Peart pass each other on a highway. One carries pipes for the coal seam gas corporations, the other carries products on the land – their paths cross only millimetres from each other and yet the narrative of each is something that is shared only by the presence of the road. As the gallery visitor travels along the highway artwork, familiar symbols, signs and fleeting glances of things that flit past one’s eyes when travelling at 100 kilometres per hour emerge. The artist Barbara Hancock has painted an endless line of lollypop stop-go men and women who demand your courtesy waive or salute ‘thanks’ as you allowed to proceed. Traffic lights enable a quick drink, or a check of phone text messages, or just time to contemplate the journey. While in the rear-view mirror a shimmering chrome grille and bull-bar of the huge road train rumbles behind you in the queue. Orange-capped witches hats sit comfortably along the edge of the road, in this case the canvas, and a police car decked out in harlequin waits and waits … Stop, DETOUR, STOP! A transition to the next road section by artist Anne Cameron presents a line of colourful truck silhouettes traversing a landscape of contour-ploughed primary producing farmland that is paired with a crop-like grid of dongas – accommodation boxes for the weary miners. An occasional car or tuck slips off the road, an old farmhouse and a lonely fisherman by a stream appear oblivious to the processionary caterpillar grub road activity. Elizabeth Corfe introduces her section with road signs of all kinds errected for the safety of all road travellers. The classic Australian house name ‘Emoh Ruo’ (our home) is being subjected to a clearing sale and the spirit-like form of a dead kangaroo hangs from a forked tree branch. The road goes on to artist Sandra Allen’s section. Amongst the black bitumen and red dirt of the road wrecking and making machinery are blood red splashes of road kill and the white chalk outlines of police markings around human road fatalities. Messages cite the author’s claim that: ‘city engineers build country roads … disaster’ and, ‘city drivers in the country cause accidents by tailgating’. The text ‘your next’ accompanies an arrow pointing menacingly at an anthropomorphised kangaroo with joey in her pouch, and the vehicle names of Toyota, Avis and Kawasaki are the perpetrators. Allen’s bold and provocative canvas road ends at Helen Peart’s simple high key painting of a road view. The limited yellow and grey palette contrast the black and red of the last section – the speed sign says 60kpm and a sunset in the west viewed from the rear-view mirror ends the day. The dark night follows where the bright light chimera of a truck’s of lights zooms past. 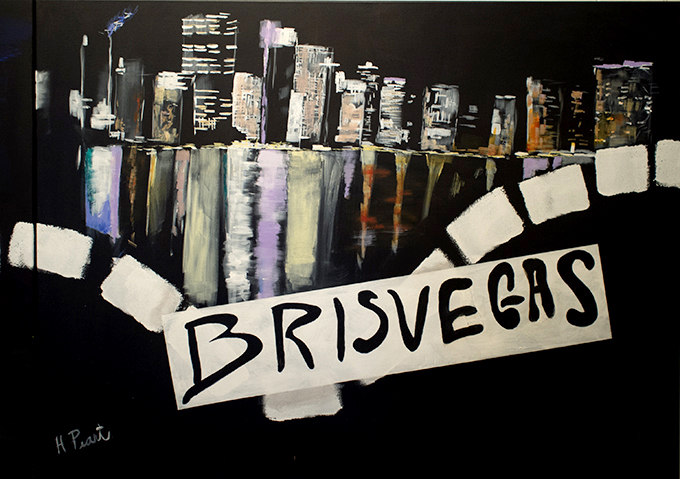 We are nearly at the end of the road and the reflected lights of the big city, entitled BRISVEGAS, seem almost placid in comparison with what has been experienced in the gallery journey. Is the big city aware of the struggle and the price paid … would they care?